While in China for the better part of March, I experienced as much and as varied bodywork as I could. I wanted to see how Eastern philosophies of medicine worked in practice, experience Chinese modalities and get some work done on my post-op ankle that has hit a healing plateau. Armed with a translation app on my iPhone, an open mind and a sense of humor, I tried a new modality daily. 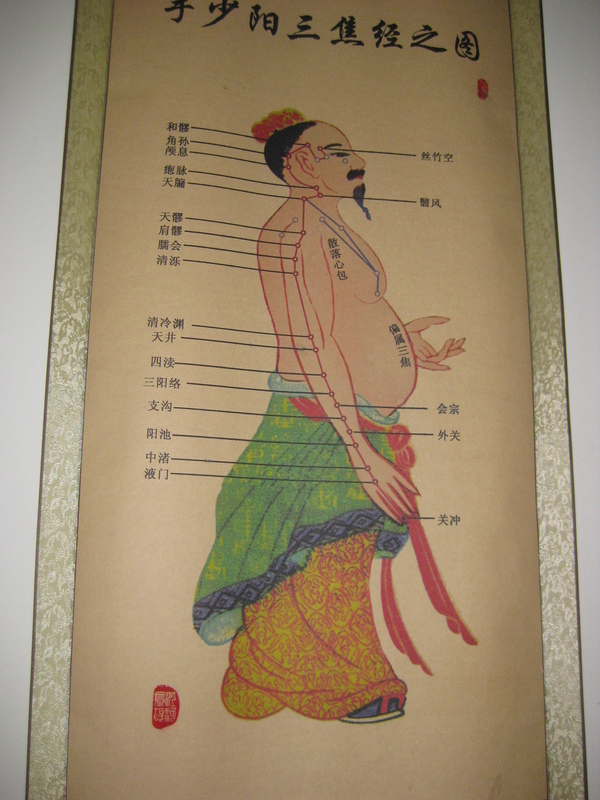 In China bodywork is a part of the medical system. 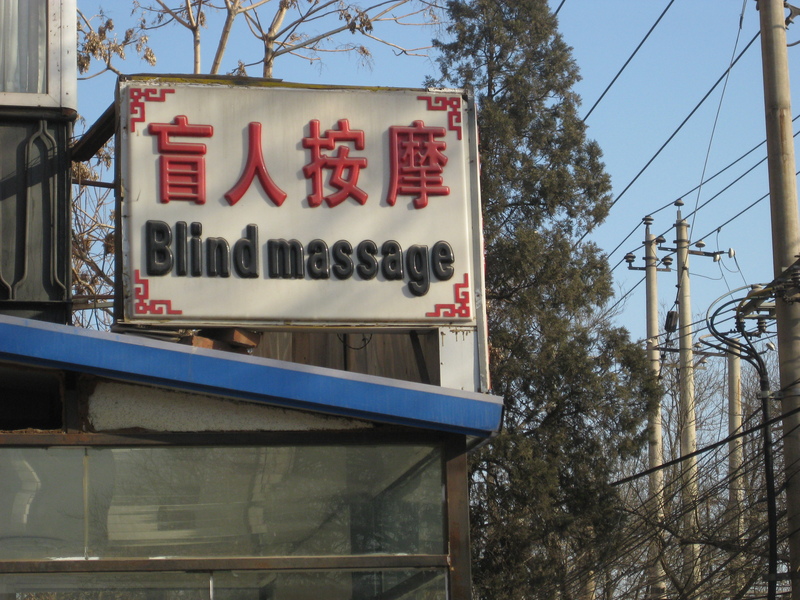 Therapists are typically based in medical clinics, but in tourist areas I occasionally saw practices with “massage” translated under the Chinese characters on their signs. I had sessions of reflexology, shiatsu (pressure point massage to balance your energy), cupping, ear candling, abdominal massage (for my organs), and even a massage by a blind therapist. Each treatment was unique, but the compassion and thorough care I received left the biggest impression. Me, after a Shiatsu session. 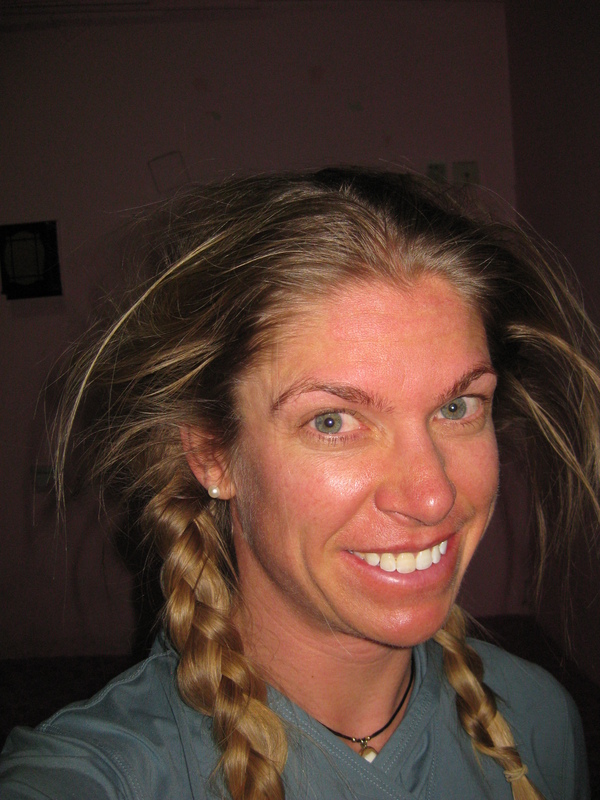 Apparently the energy left my head as if I had stuck my finger in an electrical socket. On my first full day in China I walked into a medical clinic and realized that no one spoke English and that my tiny rehearsed mandarin phrases were not understood. Finally I pointed to my ankle and was promptly ushered to a large room where a practitioner wearing a lab coat looked at my ankle. He examined my swollen ankle and healing scars to which he made a cutting gesture acknowledging my post-op state. I nodded, and he quickly left. The practitioner returned with a bucket of very hot water steeping with herbs. As he soaked my feet (a practice I later learned that almost every clinic performs), I had to resist all urges of jumping out of the almost scalding broth. While soaking my feet he started massaging my shoulders. Although I wondered if my ankle would get more attention than scalding water, I was relieved to have my shoulders addressed because they did not weather the flight to Asia well. My therapist quickly located the culprit muscles, released them through massage and in a simple fashion adjusted my neck. This was a feat. I will not let Chiropractors adjust my cervical spine (a future blog post), but this therapist simply moved my neck in a strange position and put the smallest pressure on my head, and I was adjusted. It was so simple and effective that, given the opportunity, I would let him do it again! Now that my shoulders were back on track, he went to work on my foot. I must stress the point that we could not exchange a single word, and my ankle injury (a subtalar dislocation) is a rare one to which every physician/therapist I have seen in the US has mentioned that they have read about this before but never seen it. My Chinese therapist felt my ankle, gently took it through a range of motion, tested the strength of the healing ligaments, then performed the most precise and effective manual therapy treatment I have had to date. I completely trusted this therapist to manipulate my ankle because he took the time to explore what was swollen, tight and atrophied. He understood where my injury was in the healing process and what the next step was to further my recovery. The most profound part of this therapy session was how I was approached as a client/patient. In the US, my orthopedists take x-rays, MRI’s and CT scans to see how my healing is progressing, and my therapists look at the diagnosis in my chart and evaluate my healing by the time elapsed since injury. Images reveal structural repair (if the ligament completely knit back together), and comparing the functionality of a patient against research subjects gives good measures of normal or abnormal healing. My Chinese therapist, on the other hand, used only touch to assess my injury and its healing progress. Hands-on evaluations like this show how tissue responds in dynamic situations (like if a ligament is too tight to allow motion). I feel a combination of all of these evaluations will provide practitioners with the most insight to guide their patients care. Clinician after clinician in the states has told me that my recovery will take time. I have been reassured that the structural damage is well repaired, but have not been given much insight as to what to do to improve the functionality of my ankle or what to expect down the road. My Chinese therapist did not seem daunted by an unusual and slowly healing injury. He devised a treatment and revised what he was doing by what was working and what was not. I appreciated my Chinese therapist being creative, and I think he was even having fun trying to understand how to help an atypical injury on a patient with whom he couldn’t verbally communicate with. In the West, it is easy to rely on research and standard protocols, but I don’t think this honors the intelligence of the clinician and the practice of medicine nor is this complete care for the patient. Going to a clinic and seeing a doctor/therapist is scary. My experiences with Chinese medicine showed me that treating the whole person, not just the injury creates a wellness environment that alleviates a lot of fear. I am going to make sure I have this at the forefront of my practice. No matter what type of medicine is practiced or the flavor of therapy provided, I believe compassion for the person in the room will guide the best outcome. I had to try this out. My therapist was indeed blind and performed a thorough full body massage to rival any I have had at a spa. This entry was posted in Clients, General Info and tagged Chinese medicine, reflexology, shiatsu by focusbodywork. Bookmark the permalink.